Volkswagen’s use of “dissimilar materials” — steels of different tensile strengths — within a single vehicle can lead to heat and pulling repair restrictions, a VW representative said last week. 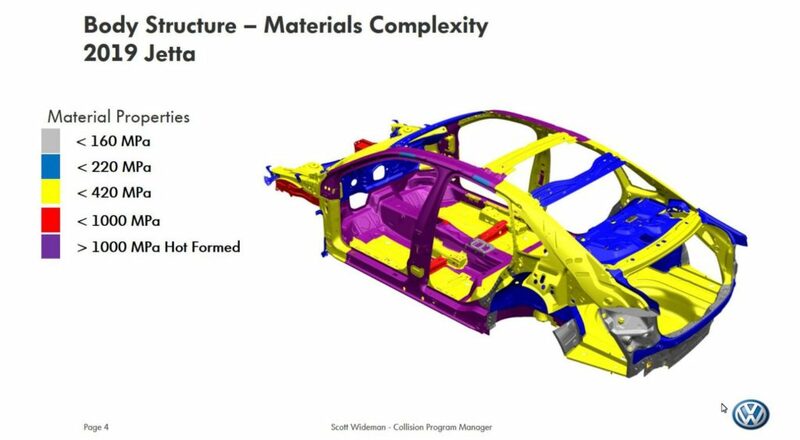 Volkswagen Canada collision program manager Scott Wideman showed the VeriFacts Guild 21 audience March 14 a slide depicting the 2015 Volkswagen Golf’s current-generation body. The vehicle contained five different types of steel tensile strengths, from less than 160 megapascals to more than 1,000-megapascal hot-formed steel. Both the U.S. and Canada share the same Volkswagen repair literature, Wideman said. Only minor vehicle differences existed, he said, providing as an example the Canadian requirement that all cars have daytime running lights. Structurally, “the vehicles are the same,” Wideman said. 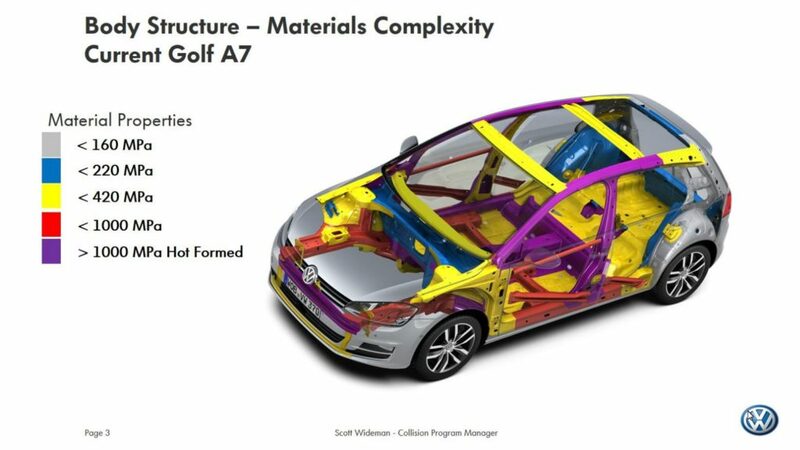 The 2015 Golf was the first to bring Volkswagen’s new Modular Transverse Matrix (“MQB”) platform to the U.S. The MQB platform is attractive because it allows different vehicle types to use the same assembly line, according to Wideman. A car might be followed by an SUV, he said. 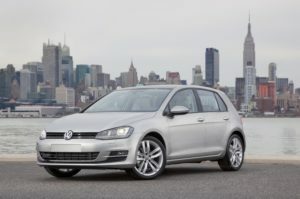 The MQB platform has spread to other models, including a next-generation 2019 Jetta that another Wideman slide depicted as carrying even more gigapascal steel than the Golf. Wideman said a mixed-steel design could be compromised if a repairer pulled the vehicle without locking down multiple points. The laws of physics meant that “the weaker material will give way first,” damaging another area of the body without the repairer realizing it, he said. He showed instructions for a 2013 Jetta which illustrated this point. If a Volkswagen product suffered body damage, the vehicle must go on an “approved fixture bench,” he summarized. • The vehicle must be placed on an Volkswagen approved alignment system and a vehicle alignment meet be performed if there is visible damage to the body structure or if the body dimensions are different than those stated in the repair manual and/or if damage to the body structure is suspected. Damage (dents, cracks, buckling) and/or if the position of a structural part on the vehicle body has changed. Structural body parts can include all body parts including outer panel parts or parts that are bolted on. Wideman said Volkswagen’s concern as a manufacturer is the “second time” a vehicle is hit. “This is where we see too many compromises,” he said. Heat from welding was also “a major concern” in vehicles with increased higher-strength steel, according to Wideman. He called heat management a “fundamental step” repairers need to start thinking about and mention Volkswagen had called for MIG brazing for this purpose. He said that even installing an exterior panel carried specific repair and attachment requirements, and he’s seen “some pretty horrendous examples” of shops doing it incorrectly. Wideman described an unspecified model-year Jetta’s quarter panel plug-welded “all the way through,” despite the level of high-strength steel in the car. He said this would make him seriously concerned that the vehicle’s integrity had been compromised. He showed a slide describing how the unspecified Jetta panel would instead have required a variety of joining techniques, including MIG brazing, plug welding, a continuous weld seam and spot welding. Wideman also said he had concerns about the notion that alternative repair procedures besides the OEM’s existed. “That scares the heck out of me,” he said. Where was the technical validation, he asked, noting that Volkswagen performed more than 800 crash tests annually at its main plant in Wolfsburg, Germany.